Tulisan Murtad: Should Israel Exist? The very question would have been unthinkable at one time. Israel, reborn after an exile that was almost comically lengthy, had a modicum of international support until the tiny nation went Bruce Lee on the Arab world in the Six Day War. Today in the international community, the Palestinians have succeeded in introducing a novel idea – centering around Israel disappearing – but posed as two scenarios: Either a “two-state” solution, by which the Palestinian state would be armed to the teeth and serve as a staging area for the final Final Solution; or a “bi-national” state of Palestine, where Jews and Arabs would gather wildflowers and sit under the stars for a folk music concert. Both “state” ideas are in fact merely window dressing for the goal of Yasser Arafat’s life: the destruction of Israel. The good guys have a host of skilled troops still left on the front lines of this propaganda war, however, and Curtis would rank as a field general. In his book, Curtis (a distinguished professor emeritus of political science at Rutgers) takes on a series of issues that really are charges against Israel: colonialism, apartheid, the Arab “right of return” and the “occupation,” among many others. He deftly presents the facts in each case, displaying Israel’s critics/assassins as bereft of truth. In Chapter 5 (“The Charge of Apartheid: The Big Lie”), Prof. Curtis lists the groundwork that was laid in charging Israel with being an apartheid state, a la South Africa. He then goes on to piece-by-piece dismantle this most reprehensible charge, pointing out that unlike South Africa, for instance, the Israelis have always allowed the minority people (in this case the Palestinians) such things as voting rights and positions in government! We usually hear that the Jews came in and stole Palestinian land, period. One of the most intriguing outcomes of “Should Israel Exist?” is a further question: Will Israel’s critics be forced to come to grips with Curtis’ decimation of their positions? His research and critical-thinking skills are that good. It is in Chapter 23 that I believe Curtis most effectively makes the case for Israel, because we get down to brass tacks: Is Jewish life of value to the international community? I’ve read quite a few books that present facts and state Israel’s position, but “Should Israel Exist?”would rank in the top two or three; I am excited to observe in the coming weeks and months the wide impact I believe this book will have. People often ask me: “What can I do to help Israel?” I always answer that they should educate themselves. 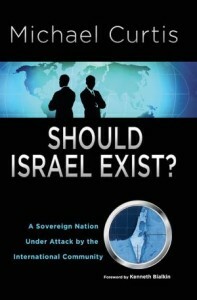 Michael Curtis’s “Should Israel Exist?” is the central place to start. Imagine if someone suggested that you should read a book that discusses whether or not Norway, or the United States for that matter, should exist. You would be shocked or at least surprised that anyone would want to question the right of a sovereign nation, and a member of the United Nations, to exist. In the case of Israel, however, posing that question does not seem to be out-of-bounds. At any given time, you might hear of or even attend conferences and seminars on that very subject in some American or Western European university. It is, therefore, no surprise that Michael Curtis, a distinguished scholar and professor emeritus at Rutgers University, has devoted a whole book to examining the subject and refuting the claims of those who question Israel's right to exist. The result is a masterly essay in which the best tools of scholarship are employed in the service of what is, after all, a moral case in support of Israel. At first glance, Israel could be regarded as typical of the 150 or so nation-states that have emerged in the four corners of the globe in the wake of the World War II. Politically, it is the fruit of a liberation struggle against an imperial power—in this case Great Britain. Territorially, it is located in a chunk of an even older colonial power—in this case the Ottoman Empire. Legally, it is a creature of the United Nations, which, as successor to the British mandate on Palestine, endorsed the creation of the Jewish state. So, why should Israel be singled out as the target of a campaign of vilification seldom waged against any other nation? The answer, as Curtis dramatically shows, is that Israel is different. To start with, it is Jewish. That makes it the target of anti-Semitic sentiments and resentments that have deep roots in many Western and some Islamic societies. In many countries, anti-Semitism is no longer regarded as just another opinion, it is a crime punishable by the law. The way to get round that obstacle is to air anti-Semitic sentiments in the guise of a critique of Israel as a nation-state. To make that somewhat more palatable, a bit of spice is often added by evoking the sufferings of the Palestinians. However, once the mayonnaise of political grievances against Israel is pushed aside, one is often left with the old unpalatable hatred of the Jew. Then there is the fact that Israel has been a democratic island in a neighborhood of authoritarian and totalitarian regimes. The emergence of new democracies in the Middle East may well change the region's political landscape. At the moment, however, as a democracy, Israel remains a threat to the despotic systems still dominant in the region. Worse still, from the point of view of its detractors, Israel has been an outpost of the democratic world for more than six decades. It is, in the sense that Curtis sees Israel, the proverbial "canary in the coalmine." Throughout the Cold War, Israel acted as the advance guard of the free world in a region of vital geostrategic importance for the United States and its allies. After the Cold War ended, Israel found itself in the front line of the global war against Islamic jihad in its many different forms. That, in turn, meant that Israel was regarded as arch-foe by Islamists beating their chests about the "occupation" of a chunk of Islam's territory by an "infidel" power. Centuries of resentments caused by the "loss of Muslim lands" in Spain, Russia, and India, among others, are blended into a single witch's brew of hatred of and desire for revenge against Israel. Thus, Israel's very existence, as Curtis shows, has led to the emergence of a curious coalition in which traditional anti-Semites, Stalinist Cold Warriors, useful idiots, pan-Arab hegemonists, anti-Americans of all stripes, and Islamist revanchists are united against a common foe. In the Middle East, as Kenneth Bialkin notes in his introduction to Curtis's essay, history is "in the making but without a guidebook". What might emerge from the current wave of revolutionary change is anybody's guess. The best-case scenario is that the creation of democratic governments in at least some Arab states would remove a few of the hurdles to the acceptance of Israel as a neighbor if, at least initially, not as a friend. But even then, Israel's many enemies in the West would remain, clinging to hatred for the Jewish state as the backbone of their moribund ideologies. Should Israel Exist? Curtis's answer is a resounding "Yes" backed by a masterly historical exposé and an unfailing moral commitment to what he regards as the justice of his cause.